As a proud graduate of Raffles College of Higher Education Kuala Lumpur, I feel incredibly honoured as I'm writing this entry right now, I think this is the feeling you get when you see your child on the first day of pre-school, kinda.. Anyway, why you ask? 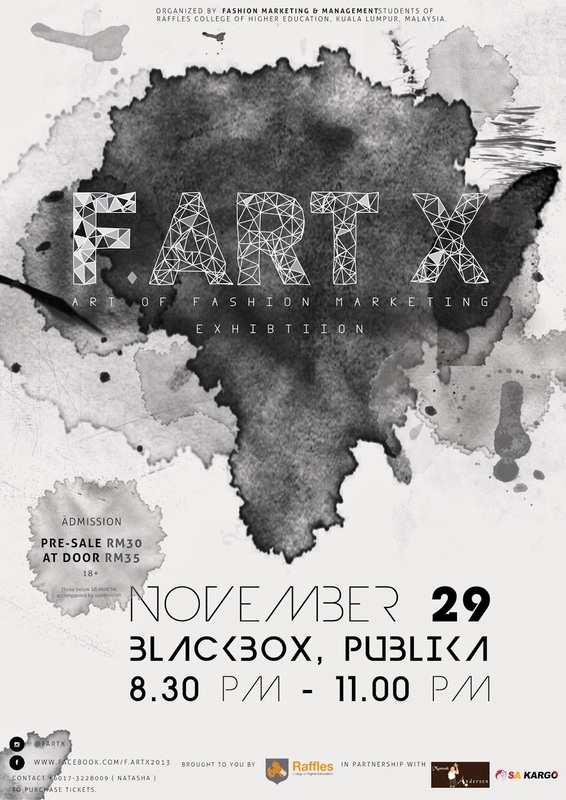 Because my course juniors (Fashion Marketing and Management) are organizing yet another fashion event as their course project, with the soul purpose of celebrating and promoting the beauty of fashion, art and logic. Awkward smiles during my convocation back in April this year. You see, the thing I love about the course, Fashion Marketing, is that you'll be covered with knowledge both artistically and logically. It trains you to think outside of the box to expand your creativity, while at the same time tests your business skills and rationality. Best of both worlds! Anyway, I should leave the convincing job to my juniors who are organizing this very much anticipated exhibition. Just looking at their media kit itself has already made me gasp out of fascination, the effort they put into details is impressive, very sophisticated and modern, can't wait to be at the event itself! Details are stated on the image above. Get ready to be showered with clouds of creativity and limitless style, FASHIONISTAS ONLY!